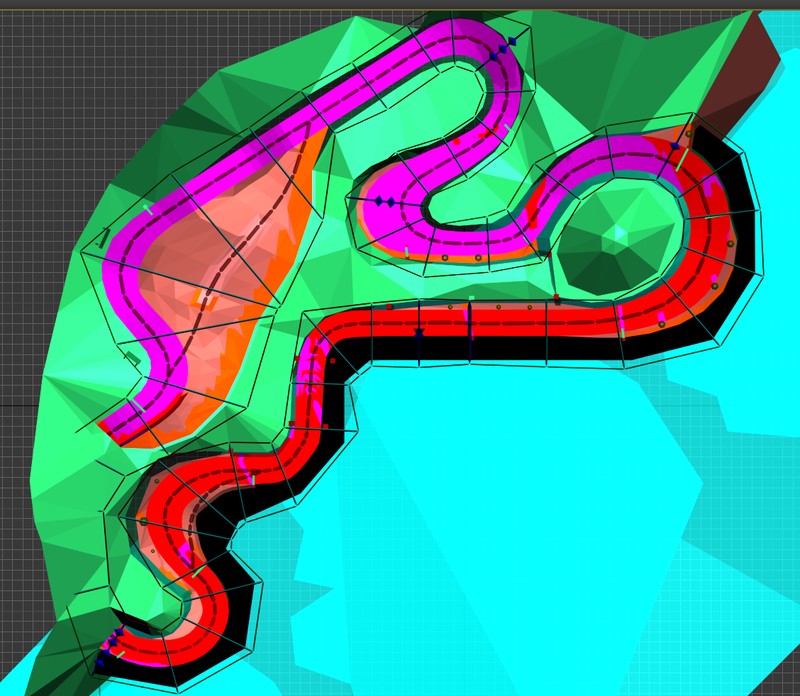 Yes, we will add cars and all stuft like the nds course. Wow, this is SM64DS master peace!! Only 2 item rows are 1-2 rows to less. Why a double item row at the beginning. Car routes and distances are very good. Some enemies will stay a a position and try to drive always into the hill. Missing some trick points at peak of the road hills. Very nice done, SM64DS! This version is a lot better than mine. Nice work! I said thoughts because of the first impressions. About the itemboxes. I understand your argument, but think about mine: If you play alone against cpus, you get every itembox you want. But if playing online with friends, single itemboxes are consumed by the first players and the following players have only minimal chances to get an itembox. And that's bad for the gameplay at all. It was my wish to use the old KMP, because I/we like the characteristics of the track much and we play DS Shroom Ridge very often. Trivia and contributions are not written yet. I think, Sniki will give you his respect. That's very disrespectful. SuperMario64DS wanted it to be an update, so that will be the case, unless Sniki and SuperMario64DS agree to do it another way. It's your choice. What puzzles me is why anyone thought they could grant others the permission to use data I created on a whim, and why this perhaps was known all along, but credits were delegated only to the video's description and those credits were incomplete (only crediting for the car route planning). I do want to know who was involved, and how this came to be that this released was made and yet someone was unaware that this was an update, not a port, even if it was the audience. It was meant to be a surprise release in the coming weeks, but I have been collaborating with another creator to release a fully updated version of my port (only borrowing the car planning, but rebuilding every other aspect). The majority of the model is already rebuilt, in similar fashion - increased complexion factor on the roads, smoothing, etc. What are we supposed to do now? Would it be considered plagiarism if we decide to integrate certain elemnts of Sniki's version others prefer the most? Or will we have to live with tis unofficial version perhaps being favoured more than our release? Is it now a new line or not? I think, it is more than a new line, it's a remake that uses the old KMP. So it's like SM64 version: A remake of a Nintendo track with new KMP (simplified!). You're missing the point @Wiimm. Sniki remade the course model and used SM64DS's KMP and claimed all credits for it except for the vehicle settings. This is not about if it's a new design or not. If I would be SM64DS, I would be very pissed. But this is not my decision. @SM64DS, as I said, you decide what to do with this. If you want to change it to an unoffical update and change the version number to something else, then do it. If you want to revert the update (or whatever it is), then do it. It's your choice. Maybe Sniki did it the wrong way. But the decision about an extra page can't be based on Sniki wrong or correct handling. And If I remember right, the page was incomplete without any explanation. Anyway, using stuff of other authors is a usual way in the community. The community lives from learning and using other work. This is especially true for remakes of Nintendo tracks. It is not admissible to clone a Nintendo track and to forbid the cloning of an own track. Another point: Discussion first, then activity (here removing pages). And so I wait for other meanings before I do anything else. I proved it: At Snikis page description and contributions are missed completely. Comparing it with his other pages, it is clear, that the page was incomplete. The the best choice was, to give him a chance to complete it and to wait with the harsh critics. Hey people: We want all the same: Fun with Mario Kart Wii. So be friendly and work together!!! I thought I had said it enough. It's up to SM64DS if he agrees with a new page, and I don't think he does since he wrote "For now, this is an update of my version, not it's own release." I have compared both tracks too. Sniki remade the track and also modified BREES files for cars, trucks and bomb. Only VRCORN and some parts of KMP are copied and optimized. KMP: The most relevant sections CKPT and ITPT (159 points in 7 sections, 202 in 4 before) are new. CAME and ENPT are copied and slightly edited. New itemboxes. Attributes of cars, trucks and bombs identical. Routes copied and optimized. So it is clearly a remake. Because of the 1:1 scaling, the routes are similar. And I don't see any reason to not use another KMP as base, because we are a community. So it is usual to use achievement of others. I'll undelete the other page now and give Sniki a chance to add a description. You did not ask permission, you cannot pull this thing out of the air "but it's the community!". If you'd like, I can formally express licensing terms for my work. Or if that's not allowed, tomorrow I will make a profuse effort to cosmetically update every track on the wiki and make them new pages and liken them to "similar", since this is apparently allowed. Sorry if I come across as crass, but it's the principle: no permission requested, improper/insulting attribution, blatant disregard to admin ruling, and disregard to my (reasonable) terms/request. What else? Once again, the credits have been removed from Sniki's video, creating the illusion that this is original work. And funnily enough, my comments on the video never get approved, so no one can see them. In the meantime, this version gets the limelight in the current production of the official (read: made with permission) v2 update of my course, Wiimm. "Posting content to the Wiki grants every [...] user the right [...], to modify this content and to release updated versions of the contents while giving credit to the content creator"
explicitly allows what Sniki did and nothing in the rules says that the release has to be on the same page as the original. The policy even states an update / new version is allowed even if the original author doesn't give permission. It doesn't state if the update is allowed to be on its own page, but that is just because that issue never came up in the past, not because it's not allowed. Try to compare this situation to a texture hack (even though Sniki modified more than just textures). All Texture hacks (even those of Custom Tracks) do get their own page (even if they copy the complete KMP) - just because from the outside, the track looks completely different and it would be confusing (for the end-users) to have them on one page. Are you proposing we should cram all texture hacks of tracks onto the original track page, too, with hundreds of "updates" for one track, all looking different? And you are free to update as many tracks as you want - and if they look completely different, you can also post them on a new page, just like Sniki did. Just don't start selling us small cosmetical updates like "I added one item box" and "I changed one single texture" as huge updates requiring a new page - that has never happened in the past, hasn't happened in this case and will not happen in the future. Right, last I checked Nintendo was okay with Homebrew, mods, and re-releasing content, so we cannot get permission from Nintendo. As per the Published Works Policy, you can get permission from me, an actual human, not an organization. First, is is really necessary to split this discussion on three different talk pages? Second, it doesn't violate the rules. The "if you are editing another author's work ..." rule is a guideline to prevent authors from getting angry about doing unnecessary work / doing work twice if they are already working on a (bug)fix and / or update while another user wants to make one. The rule states how the update can be released (as official new version, as update (either on the original or a new page, it doesn't state that). And it explicitly state that updating tracks is allowed even if the original author disagrees. Third, the rules update in October 2017 was made explicitly to allow track updates by everyone and to prevent "private" versions of tracks (the last part doesn't apply to this situation). The part with asking the author if the update will be official is just incidental stuf to determine if this will be an official update (directly on the same track page as a regular update) or an inofficial one (stated as update, either on the same or on the new page). The rule change resulted from a long discussion between me, Wiimm, MrBean, Tock, and the Wiiki Administrators (Wexos and Atlas) - not just "Sniki and his friends". If you don't think the rules fit to this situation, the rules need to be changed, not the situation. Quoting SM64DS from another page: "You're statement on that this policy page is inconsistent with your last - this is policy, not "every other bullet is a guideline." The "rule states" that the author must be contacted. It never states a case for when the author isn't' contacted, and it does not state that the update can be applied to a new page with minimal attributions." It does not state that it can be applied to a new page, that is correct. It also doesn't state that it can't. And it doesn't state a case when the author isn't contacted, that is also correct. That is what I meant with "if the rules don't fit to the situation, they need to be changed". These are messages to Wexos for assistance. Then there was a reply to Wiimm you joined in on. You're statement on that this policy page is inconsistent with your last - this is policy, not "every other bullet is a guideline." The "rule states" that the author must be contacted. It never states a case for when the author isn't' contacted, and it does not state that the update can be applied to a new page with minimal attributions. Very important: This is a Wiiki, and it also for the public and not only for CT creators. It is not your page, it is a public page and now we have 2 public pages for DS Shroom Ridge. You declared, that Snikis version is a branch or fork. And the Wiki politics is, that every branch gets its own page for clearness (see Talk:Volcanic Skyway II). Examples: Aquadrom Stage 2, Snowy Circuit 2, Volcanic Skyway II, Punch City 2. There are many other pages marked as category:Split Article. And so I decided as I did it before for other tracks: One page for every branch. And other track pages will follow. I can't see why we should make an exception for this track. The page split is not the first and will not be the last! Btw, you are using part of other tracks too. Have you asked Nintendo for permission? Claiming ownership is an invalid and egoistic step and contra productive for the community. I created tools and Wiimmfi for public use and always accept tracks, distributions and other software even If I don't like them. From the beginning my focus is the community: Create something and give others a chance to make it better. And the foundation of this Wiki follows the idea. And with this politics I can't accept: "My track, my page, and all other related stuff/branch is mine too". Again: It is not your track (in terms of legal ownership) and more clearly not your page! You are only the creator of the track and published it here in this Wiki.. We are deeply grateful for this job. And so I don't discuss the egoistic "mine mine mine" discussion with you. We have already discussed this, but clearly we didn't finish the discussion. Me and Tock didn't want anyone to be able to update any track without permission, and that's still what I think. In the past, a lot of rejections have been done for track updates where the original author decided, so is this an exception? Quick Course was an edit of a SpyKid track and was deleted very recently. And SuperMario64DS did allow this update, but he wanted it as an update on the same page. The track has the same layout, only the track design has been changed. Also, ask yourself this: who is selfish and egoistic? The one who does the job and don't want anyone to steal the credits for it, or the one that copies the job and claims the credits for it? The answer should be pretty obvious, but right now you're blaming SM64DS. It's pointless talking about if we asked Nintendo. If you want to continue the discussion about it, then we can just shut down everything we've done, because everything we do is against what Nintendo thinks. @Wiimm You haven't really done any track yourself from what I know. I don't think you understand what it feels like if someone would copy your work and claim all credits for it. Sure, you created Wiimmfi for public use. Maybe if the source code was available your point would make more sense, that anyone could edit anything. Finally, mods done by authors should be their mod. It's not selfish, it's about respect. It's simple, if you want to update something, then ask. If you get denied, then make your own from scratch. I was very busy in the last days, so I'll answer in the next days. I have only 1 question to Wexos: What is the essence/soul of a track? Model, Minimap, vrcorn, Custom objects, KMP at whole, KMP/CKPT, KMP/ITPT, KMP/* or a combination? Because of length and structure, I created a new section. I have signed each subsection. So each subsection can be answered separately. @Wexos: Your answer makes it very clear: Snikis version is not an update of SM64s version, because nearly all and in my opinion all important parts are new and only some parts are copied. A more detailed analysis comes below. I never created a complete track by my own, but I created KMP for many tracks. And I know, the KMP is more an technical step than a creative step. If you give me any track, I can create CKPT, ITPT, ENPT, JGPT in less than 2 hours. Routes and positions are very clear, because they follow the roads and borders of the track. So the only creative part of this is deciding splits and joins. And if I create a KMP, forget it, and create it a second time, then result is almost the same. In my eyes, the modeling part is more creative. 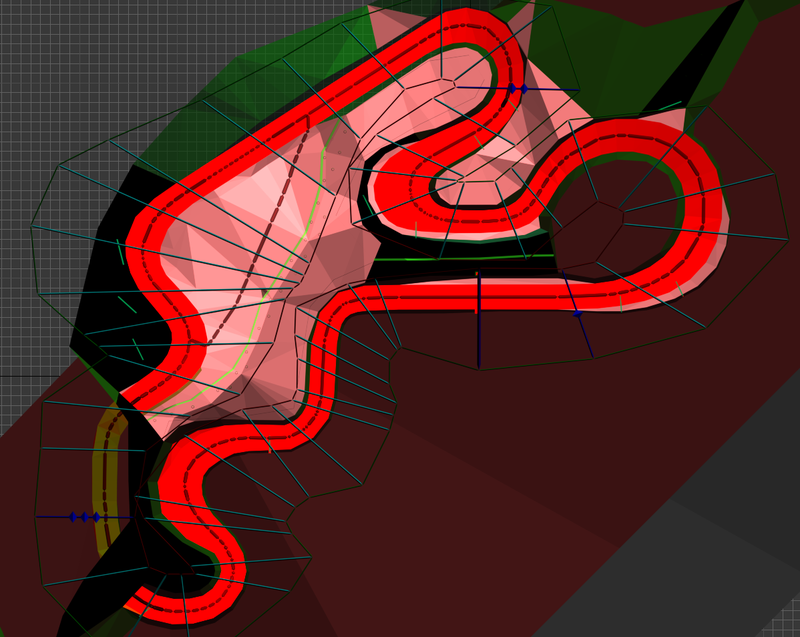 And for new tracks, the general design/layout is the most creative part. A week ago, I created the log file. After writing the summary it was clear, that Sniki made a new tracks with same origin and scaling. And he copied some parts of the enemy route. I think he used the old KMP first for testing and then he re-created some important KMP sections. My summary: Sniki remade the track (model and minimap) and also modified BREES files for cars, trucks and bomb. Only VRCORN and some parts of KMP are copied and optimized. The most relevant KMP sections CKPT and ITPT are new. CAME and ENPT are copied and slightly edited. Itemboxes new. Attributes of cars, trucks and bombs identical. Routes copied and optimized. After undelting the page, Sniki uses his chance to document the copied parts. Before he hasn't a chance, because the page was deleted very fast. Now let us compare both top views of the track: Layout is the same (what else, it is a remade of the same track). But KCL (and this means model), check points and item points are different. This makes my position more clear: It is a new track, that use some parts of another track. Is this really an argument? Z is simply the middle of the road. So Sniki moved the point and doesn't change Z. This is definitely not the truth! I think he chosen this word carefully because he knows the differences. He want to suggest the equality without saying it. So it's a rhetorical trick, and not his lat one. What's bad with the same number of checkpoints? I think he wrote this, because he known that the checkpoints are new. Otherwise he had written same check points. Again a rhetorical trick to suggest equality. The are mostly the same. But why not comparing the number of respawns; for checkpoints he did it. Because the number is different? SM64 picks out some aspects and suggest, that the KMP is the same, even if a section is completely different. If I read such overdone arguments with rhetorical trick to disguise the truth, I became angry I don't believe the author anymore. And from old times (@ mariokartwii.com) I already know this behavior of SM64. Another question: If I create a complete new track NEW and use some custom objects and modeling parts of another part of track OLD, is NEW an update of OLD, or a new track that uses some parts of OLD? Wexos wrote: The track has the same layout, only the track design has been changed. The track has the same origin and scaling. And SM64 claimed a copyright for both??. Btw, Nintendo Shroom Ridge has the same layout too! Wexos wrote: SuperMario64DS did allow this update, but he wanted it as an update on the same page. Irrelevant, because it is not an update. And he has not to decide the wiki page layout. In general I agree. A author should ask for permission. It is more a question of etiquette than for copyright, because no one except Nintendo can claim any copyrights on retro tracks. And following the proof of above, Snikis version isn't an update! About »Quick Course«: This is a wiki, that delivers information about all MKW-Wii stuff with minimal exceptions. I'm not sure if »Quick course« is an exception (not noticed the removal before). In my opinion, Snikis version is clearly not an update of SM64s track. If reading the arguments of SM64, it looks like a simple update. But SM64 misleads the readers with rhetorical tricks and an incomplete comparison into the a wrong direction. He never told, that model, minimap, vehicle models, checkpoints and item points are clearly new. Another point: This is a wiki, that offers information about MKWii from technical information to custom tracks/fonts/textures/objects/... So the page about a track is not owned by the user who created the track. And for uniformity the moderators decide about pages and its layout. I see it very critical to delete pages only because one member wants it (here »Quick Course« and »DS Shroom Ridge«). It's a kind censorship. Nearly always it is better to inform at the new page about copied parts and give the page creator a chance to declare it. Fast deletion is the most bad solutions. For clearness: SPAM and illegal content must be removed immediately. Now I have wasted some hours with a more deeper analysis and for writing this. This page was last modified on 18 March 2018, at 02:08.